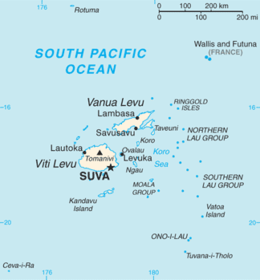 Vanua Levu (pronounced [βanua leβu]), formerly known as Sandalwood Island, is the second largest island of Fiji. It is 64 kilometres to the north of the larger island Viti Levu, the island has an area of 5,587.1 km² and a population of 130,000. This page was last changed on 9 April 2013, at 19:49.